Regular readers will remember that I predicted that China would be using 247 quads by 2030, far more than the Department of Energy’s forecast of 163 quads. Is it possible they will be using even more than my pessimistic prediction? The U.S. DOE’s International Energy Outlook for 2011 (they canceled their 2012 edition) predicted an average annual growth rate for China’s energy consumption at 2.3% through 2035. If China continues to increase energy consumption at 7% annually, by 2030 their consumption could reach 316 quads. India’s growth in energy consumption has averaged 8% per year for the past decade–the DOE predicted their growth would be slower than China’s. If they continue at their present pace they will reach 237 quads by 2030. The two countries alone will consume more energy than the entire world did in 2012. Forget toys, Lenovo computers and iPhones from China. And forget willing call center workers and Bollywood films from India. What they will be offering the world for the next few decades consists of pollution, black soot to float up to the Arctic and growing amounts of CO2. I don’t blame them a bit for what they’re doing. I do hope they do it fast enough so their leaders can become as conscious of environmental impacts as some in the developed world. Many of their citizens already are–some have even moved ahead of the West in environmental consciousness. I do blame us for ignoring what’s happening. If we’re not careful we’ll hit the 3,000 quad barrier before 2075. And it will be coming (mostly) from coal. Look, people–I understand that the fight on climate change has real reasons behind it. I feel fairly certain that some activists have wildly exaggerated what they claim climate has already done due to global warming. I have come to believe that atmospheric sensitivity is lower than some activists claim. But really–are we going to ignore the coal that India and China will burn to generate more energy than the entire world consumed this year? Let’s review the Chinese coal situation. China’s coal is deep, of low quality and it is wet. The ‘wet’ part is of concern. Wet low quality coal is just like hay that has been put up in the barn when it was wet. Eventually the barn is going to burn down. Now lets add the depth…methane concentrations tend to increase with depth. So now we have a Chinese wet hay barn, with an average depth of 550 meters deep that is methane rich. China employs more then 5 million workers unloading this ‘barn fire’ waiting to happen. To describe the work as ‘suicidal’ would be reasonably accurate. Proper ventilation can reduce the risk of methane explosion but there isn’t a lot that can be done to prevent spontaneous combustion outside of keeping the mine filled with inert gas…of course that makes breathing a bit of a problem for the workers.. In the year 2015 the Chinese work force begins its permanent decline in size. In a market with a declining number of workers the first jobs that the workers will shun are either the low paying jobs or the dangerous jobs. That’s $60/ton before we’ve paid for the coal. Powder River Basin Coal is a relatively low grade, about 4,700 kcal/kg or 17 MMBtu/ton…about $3.52/MMBtu just for the shipping. If we add $10 to dig the coal out of the ground that gets us to $4.11/MMBtu. The average ‘delivered’ price of coal in the US is about $2.40/MMBtu. We can add the minimum of an extra $17/MWh in fuel cost(assuming 10 MMBTU/MWh) the Chinese would have to pay to the levelized costs of various technologies as priced by the US EIA. Solar PV stays at $152/MWh. Coal barely ends up being cheaper then Solar PV. I think there is a reason the Chinese have moved their 2020 targets for Solar and Wind forward…I think it’s called ‘save my wallet’. No question they want to do so, Harry. But they just can’t build it quickly enough. They’re building what–100 dams and 150 nuclear power plants? And it won’t be enough. They’re just going to keep burning coal until they can get the rest of it built. And it won’t be soon. I tried to find the current prices for West Coast thermal coal, free on board (FOB). Looks like it could be done profitably under 100$/mt CIF. Lack of port facilities on the west coast seems to be the problem. Of course, this all depends on the cost of China’s domestic coal supply. If imports are cheaper, they will import more. In 2012 the Chinese came pretty close to meeting their electricity growth with ‘other then coal’. As far as Hydro they are committed to adding 20GW/yr until it’s hydro resources are exhausted. Boom/Bust construction is considered bad’even in China. The last I checked IAEA documents China has the industrial capacity to build 16 GW of nuclear power plants per year. There aren’t any hindrances to rolling out ‘other the coal’ generating capacity that time won’t fix. Just a small request add your own climate blog to your blogroll it will make it easier to check in on both places. I’ve done it, but this blog’s ‘theme’ no longer allows me to choose where it appears. Let me know if you find it easily. China has been improving its coal transportation infrastructure and production. 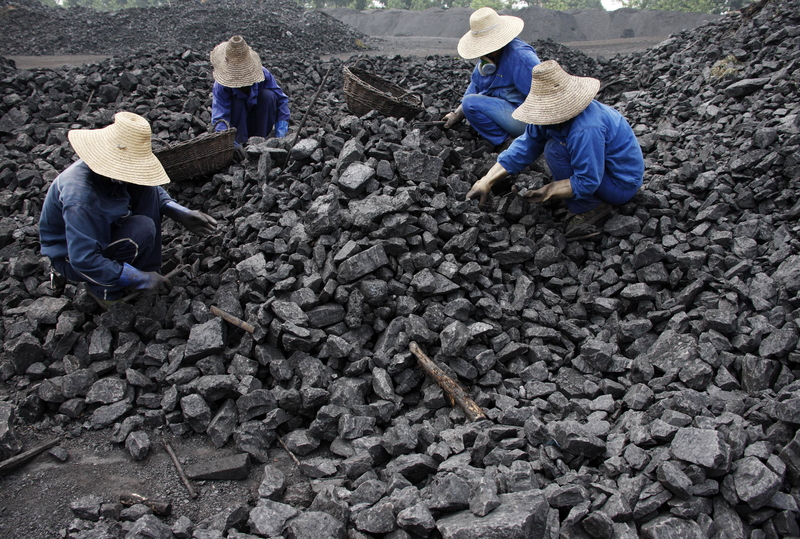 This means China’s domestic coal production will outpace demand at least until 2015. Globally, this means lower coal prices as Indonesia, Australia and others have boosted export capacity. US will probably be the only place where coal consumption will not increase. “Thermal coal at Qinhuangdao, China’s biggest delivery port for the fuel, will extend declines in the next two years as production outpaces demand and transport constraints ease, Sanford C. Bernstein & Co. said. Prices may fall 5 percent this year and another 10 percent in 2013, Michael Parker, an analyst based in Hong Kong said in a report today. The decline will also occur as China’s 2012 coal production growth of 6.6 percent outpaces demand increases of 5 percent, the note shows. This continues in 2013 as consumption changes slow to a gain of 4.2 percent amid an output expansion of 6.1 percent. China is expected to add about 11,000 kilometers (6,800 miles) of coal-dedicated railroads between 2011 and 2014, raising transport capacity by 1.3 billion metric tons by 2015, according to the report. Trains will be able to carry 334 million tons more this year than in 2011, an increase of 15 percent, the analyst wrote. I think I can find an article hypothesizing virtually anything related to Chinese coal. I could also probably write an article making any case anyone wanted to make as well. Well, people seem to interpret things differently. However, in a couple of years we will see the outcome. My bet is on increasing Chinese coal consumption. That is just the beginning of a long sordid story involving people getting themselves upset. We have 150 million tons of coal port facilities ‘proposed’ in the Northwest. The ‘preferred’ rail line(Stevens Pass) is already at 120% of capacity. A friend of mine is a railroad engineer…O2 masks are required in Stevens Pass tunnel. Stampede pass is no good for hauling coal as the grade is too steep. That leaves the rail line along the Columbia River as the only viable way to get coal to Pacific Northwest ports…that line is at 80% capacity already. So even if we build the ports we soon run into rail line capacity problems. In addition to the congestion in Washington State,Sand-point, Idaho also has congestion problems. Then there is the issue of Draft Restrictions along the Columbia River…(40 feet or so)…clearly too shallow for Cape Size. So even if we haul the coal along the Columbia in order to get it ‘over’ the Cascade mountain range we then need to haul the coal to a deep water port capable of handling a ‘Cape Size’ vessel. It appears to me that you both are pretty much correct. China is fighting desperately to find alternatives to coal. They are willing to spend significant sums on nuclear, hydro, solar and wind. They will be equally willing to spend on natural gas. But it isn’t taking hold yet. They need coal and will for the foreseeable future. This stuff takes a little time. Both postulates are in the realm of ‘possible’. Personally I think it depends on what Chinese GDP growth rate ends up being. 8% or less and I think they will manage to catch their tail. More then 8% it’ll be coal. It also depends on the price of coal. In China, electricity prices are capped by the state and power companies ability to make money depends on the price of coal. There’s several railroad projects to put coal back on rails (trucks have been used to haul coal and that increases costs a lot), as well as mining consolidation. Both are expected to lower the prices. Basically, China is such a huge force on the coal market that if China’s domestic coal price goes down, it will have a direct effect on the rest of the world. China imports coal including from my country South Africa.